Halvor O. Holte was part of the "Viking" contingent to represent his community in the Norway Day parade at the 1909 Alaska Yukon Pacific Exposition (AYPE) in Seattle. See the explanatory blog entry for this series: Poulsbo Vikings at the Alaska Yukon Pacific Exposition, 1909. It is not known whether or not Halvor Holte actually lived in Poulsbo, Washington, or how he was selected as a representative member of that community for the AYPE. By 1913, the Seattle City Directory listed Holte as a watchmaker, so it is likely he was living in Seattle by 1913. Holte was born on October 7, 1881 in Rindal, Norway. Having immigrated from Norway in 1906, he was a more recent arrival than the other Poulsbo "Vikings" who participated in the 1909 AYPE Norway Day activities. Holte, a naturalized citizen, was also younger than the others. He was about 27 years old when the photograph to the left was taken. Holte had the dubious distinction of having to register for two United States drafts in his lifetime. His registration card for World War I lists his brother, Nils Holte, from Bellingham, as the next-of-kin, so it is assumed he was unmarried at that time. Tall and slender, he had brown eyes and brown hair., and it is very probable that the mustache he sported in his Viking photograph was a real one. By 1918, he lived at 921 Water Street in South Bend, Washington. Holte registered for the World War II draft in 1942, when he was about 60 years of age. At that time, he still lived in South Bend, with his wife, Dora, from Montana, and their son, George. 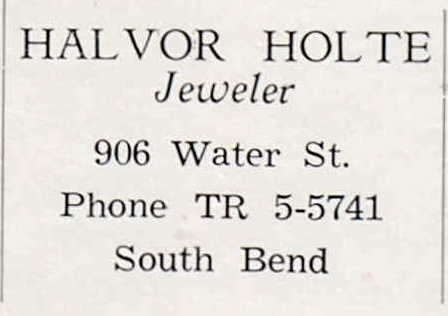 At some point in his professional career, he began advertising himself as a "jeweler" instead of "watchmaker," as the add from the 1958 Raymond High School yearbook shows. Fortunate to be very long lived, Holte passed away at age 97 in Pacific, Washington.